I've been needing and looking for a vacuum for some time..the old one retired. thought about a Kirby..my grandparents had one years ago. my sister suggested looking on overstock.in little time i selected the G4.so glad i did!..so far everything is working well..and more! loving my Kirby! 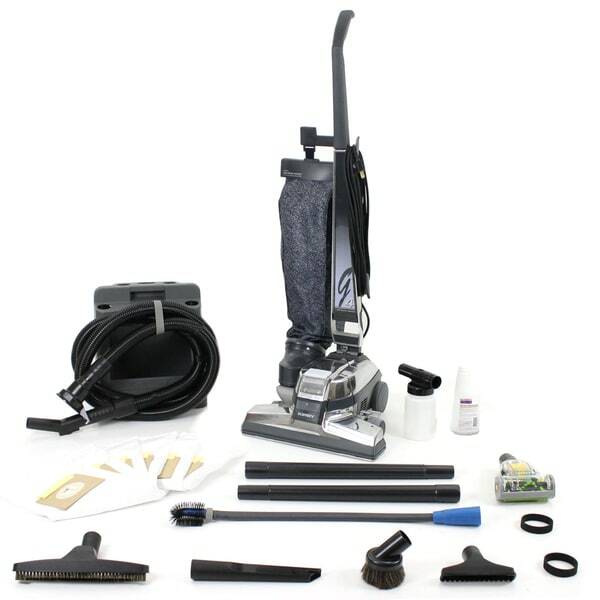 This G4 vacuum from Kirby is loaded with GV made tools for Kirby, like a pet tool mini head and deep cleaner so you have what you need no matter the situation. Unlike other vacuums, the Kirby has suction all the way across the head for a deep clean. This high-quality item has been refurbished by a professional outside firm. Please click on the icon above for more information on quality reconditioned merchandise. The vacuum arrived on time and in good condition but the following parts were missing: surface nozzle, air intake guard, inflator/deflator tool, portable sprayer, portable shampooer. And, yes, the product description says "Kirby G4 vacuum loaded with tools". So far the only thing which was fully *loaded* is my credit card charge. I sent email to Overstock.com CustomerCare with request to mail the missing parts. Now waiting for them to be delivered.. Description says refurbished but honestly it looks and preforms like it is brand new. The accessories are brand new. Very pleased with this purchase. Got a high quality vacuum for not much more then the cheap quality vacuums sold in the big box stores. I bought mine over 20 years ago and it still works great! The suction is awesome and the shampoo attachment cleans very good. The belts hold up very well, but they need changing a couple of times a year, but are pretty inexpensive. The bags do well, but you can tell a progressive loss in suction when they are about half full. If you have pets with a lot of hair, you will need to manually clean the beater brush pretty often. It can be a chore taking it out of the head, but it does come out and clean up well. Our church needed a new vacuum a couple of years ago and I found a used one at a vacuum store for $100. Bought it and it works good. The price here for a refurbished one is a good deal though. I would check them out whenever I might want to get a new one. The "old boy" is still running like a champ though! Just like new, without the cost! If you thought about purchasing a Kirby, but was turned off by the price, refurbished is the way to go. This is the first refurbished Kirby we purchased and we are more than happy with it. We were skeptical of a refurbished product, but I have been using for over a week now (almost daily) and love the performance and ease of using it. It really is no heavier than our old Hoover upright, but it is a little tricky learning how to attach the accessories, however once you get comfortable with it, it becomes a little easier. The product arrived within the specified timeframe, with all the accessories, the only thing I had to download from online was a User Manual since that did not come with it. It did have a CD for a Sentria model, but it was still helpful. I had to attach the handle which was a breeze-only requiring a snap-in-place piece and a Phillips screwdriver to attach the cord holder. The Kirby is working great and we have noticed and improved look of our carpet and smell of our house. The product and accessories new. The price of a refurbished Kirby is more than reasonable and you still get an outstanding product that holds up to the Kirby name. This product makes me enjoy vacuuming because I know my house is cleaner because of it. We love our "new" Kirby!!!! Great vac and a mud better value than buying a new Kirby. My wife and I have owned a Kirby for over 30-years, have one in each of our homes and needed one for the move to Hawaii. Kirby was our only choice. Received the G4 in a reasonable amount of time, came with all the advertised attachments (which included a super long accessory hose @ 12'), two extra belts and a box of bags. My only problem was that the drive on the unit stopped working after my first use. Followed the instructions that were inclosed in the box to report the issue with the supplier, GreatVacs out of Utah. They got back with me the next day, had a new base G4 unit UPS'd out to me the following day, and it arrived in 3-days. Quick swap, put the defective G4 base in the box with the return UPS label provided by Great Vacs and we're a "full up round" again. All with a couple of e-mail exchanges ... very good customer support! Much appreciated. We would highly recommend this vac to family and friends ... our entire experience has been positive, and at the end of the day, Kirby is the best vacuums out there. Worth the time and $$! My mom bought a Kirby about 12 years ago and spent $1200.00 (crazy expensive!) so I am familiar with how amazing the product is. This vacuum cleans like no other. I swear it's engine is made like a jet engine. My rugs look and feel great after I vacuum. It is the type of product that you don't want to stop using. When I'm done in my house I want to call up people I know to go over and vacuum their rugs! I was never willing to pay full price for one and almost bought a Dyson because I didn't realize I could buy a refurbished Kirby and pay the price of a Dyson. My only concern, like buying a used car, is that it will break down much sooner than if I had bought new, but so far so good. I ordered a Kirby G4, but when my shipment came it was a Kirby G6. I wasn't notified it was going to be different. They didn't charge me extra and said I could return it if I didn't want the G6. I've had the G4 model for 22 years and liked that model and was very excited that I was going to get another one and was disappointed when I opened the box and when I called they said they didn't even have G4 in stock. Decided to keep the G6 and it works very well and is in very good shape for being refurbished. It was supposed to come with a tool caddy but I did not receive that so they gave me a credit for that item. They were very helpful and answered my emails to them in a timely manner. I was upset that no one notified me of the different model, but in the end, they were helpful and took care of the problem. This vacuum is heavy to carry up or down stairs. But will pick up most anything. I don't like not being able to just take off the hose to vacuum under radiators or basebords. It like having to vacuume twice first the floors then again to to under things, after changing the attachment. But I love it. this Kirby works well, luv my Kirby!!! This vacuum device has for 40 years been and still has everything I need cleaning floors and carpet. I highly recommend buying a Kirby vacuum from an actual Kirby distributer instead of Overstock. My vacuum arrived so slowly I think they sent it by pony express. When it arrived, the unit had a huge crack in it. It also did not have extra belts, instruction book, or the plastic holder for all the attachments. I first attempted to contact Overstock by email. Not wanting to wait until my 45th birthday to recieve another, I simply asked for them to refund $* and send me the belt and holder. I got a form email in return. I then contacted by online chat, which said they were going to send another one. Before I could say no, the online chat stopped working (imagine that). I once again sent an email, and got a form email in return. After a couple more back and forth like this, I finally got a personal response to say my case was being closed. Despite all of this, the thing still worked, so there is that. Researched all the new vacuum cleaners out there with all the plastic parts. Decided to go with the old reliable Kirby. I had owned this version before. (The ex kept the latest model). All the parts were nice and extra long hose. The 4-star rating is because the air flow seems weaker than I remembered it. Or maybe I just got used to the latest Kirby generation. Refurbished is way more affordable too! Took a few days to get here, but overall great deal as the vacuum is amazing!!! The vacuum arrived nicely packaged and appeared as shown in the picture. Overstock states the following in referring to refurbished "Some Reconditioned or Refurbished items will show a slight amount of wear and tear, some items will look brand new." There was no slight amount of wear. It was clearly very used, hole in the handle and a serious crack in the nozzle. When we tried the vacuum, dust and dirt went flying. This is how we found the very large crack in the nozzle. It is a testament to the Kirby's sucking power, but a very disappointing purchase. The online chat agent was very nice and arranged for another to be delivered, but I still have the hassle of returning the broken one. (Overstock is covering the cost as they state). To their credit, overstock was easy to work with on the entire debacle. I'll post an additional review when the replacement arrives. "I recently purchased carpeting that has a high pile. I need a vacuum that will adjust in height. Will the G-4 work? Thanks, Jan Jones"
Yes, this vacuum is adjustable in height. "Is there a way to purchase actual Kirby belts and bags from you? I want the ones made by Kirby for the G4." At this time we do not sell Kirby brand bags or belts on our site. Do a search. There are companies online that sell filters, vacuum bags, belts etc. Overstock is just that overstocked merchandise. I've owned Kirby home cleaning systems for over 56 years. My current Kirby is over 25 years of age. It is not old. "I was wondering if you could possibly send me a copy of the 5 year warranty? I wanted to know how the warranty works, who pays for shipping the item for repair, what it covers, etc. Thank you!" You will be contacted by Customer Care. I had one that just died. I bought one brand new Kirby in 1983 and used it everyday for years..upgraded to this same one in 1980s. I moved to new home with hardwood floors and gave it away 10 years ago because it was just sitting in basement...still worked. I recently retired, sold my home and moved into apartment with CARPET. I need my Kirby back! "What is the difference with the Kirby G4, G5, G6, G9?" Hello rogjen, The difference between Kirby G4 Vacuum (Refurbished) and the g5 g6 g9 is the filtration and fan style some are micron filtration some card hepa, and some fan styles are plastic and some are kevlar. Thanks for shopping with us. I have owned a Kirby since 1961 and have been sold on this product. My son and I sold Kirby home cleaning systems many years ago. My first Kirby was a used one a sewing machine guy accepted as a trade-in for a Singer sewing machine. $** and I took in, a great investment and sold me on the product for many years. My second Kirby home cleaning system was a refurbished one purchased directly from a Kirby dealership. It was only $***. That was 1973. It was still working great when I purchased a new one at my son's wholesale price in 1992. It is still working well. When going on demonstrations with my son, I cleaned chocolate off the back seat of a car. The children had allowed a chocolate candy bar to melt on the seat. Yes, I removed all of the chocolate. The Kirby carpet shampooer works great too. It does not wet vac like some companies do. Wet vacuuming will null and void a warranty on the carpet and damage the padding under the carpet. Another reason I am still sold on Kirby home cleaning systems. I say home cleaning systems because it is not just an upright vacuum. With all the attachments there's many things that can be cleaned with this system. The G4 is what I have and will still use because of the HEPPA filter. I married my high school sweetheart over 50 years later. He was taking care of one of his daughter's cat. I had never been allergic to cats but became allergic all those years later. He was feeding the cat and grooming the cat at our back door. That door faced the north so when the north wind blew the dander from that cat came in. My doctor told my husband to vacuum the patio which was a huge one and use a HEPPA filter vacuum cleaner. He did and he made the daughter take her cat back. Over 25 years later my Kirby is still working and over 56 years later and I am still sold on Kirby. "I have an old Kirby that does an excellent job,but I have reached the age where I would like to have a self propelled. the description doesn't mention, so I assume it isn't. By the way, my sweeper, when I purch. it about 20 trs. ago was refurbished. Still sweeps good & I have animals." Hi, glenherman. Happily, the Kirby G4 vacuum is a self-propelled model! Thank you for shopping with us, and have a wonderful day. "what is the weight ?" Thank you for contacting us lou4thson. The weight is 32 pounds. Please let us know if you have any further questions.